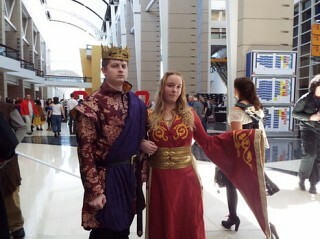 This costume was a lot of fun to wear, especially since I had a Joffrey with me. 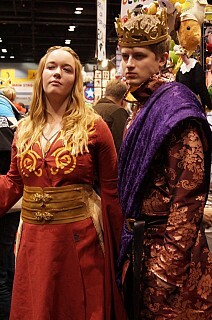 All the loving hate we received made these costumes great. 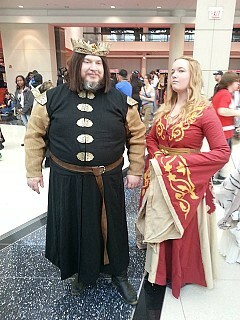 I altered a pattern and made the entire costume myself. The belt is made from Worbla and netting that I painted gold to look like chain mail. I printed out a huge image of the Lannister lion then cut it out to use as a stencil on the sides. I free-handed the arm designs. 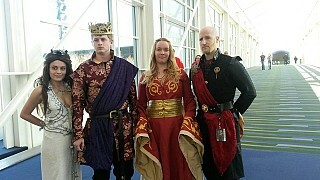 Mohmoh you make a wonderful Cersei!